Why is competitive analysis important for Matchmore? 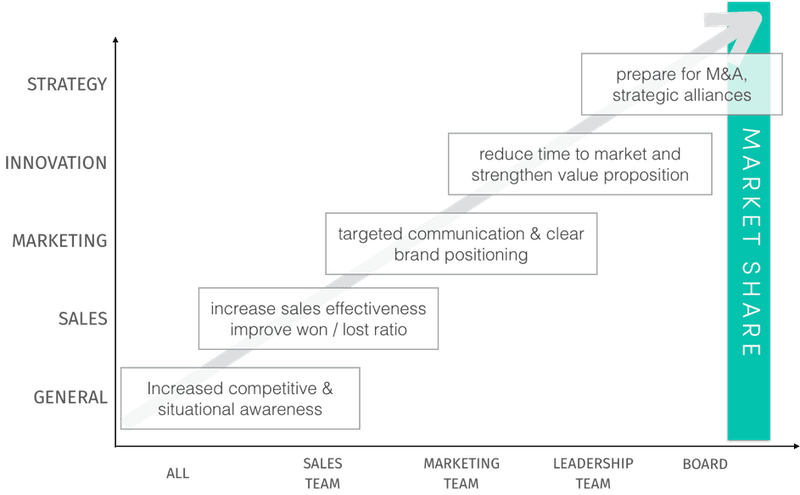 Why is competitive analysis important for Matchmore? Matchmore is a Swiss startup that is closely watching its competitors. But why is competitive analysis important for them? Matchmore is cloud service that provides developers of mobile applications with SDKs and tools to ease the integration of location-based and proximity features in their apps. Their cloud service offers a simple yet powerful and flexible programming model with scalable execution and an efficient cost model. Their mission is to provide tools which dramatically simplify and accelerate the development, testing and deployment of rich application scenarios based on multiple moving and connected objects, making such scenarios the new low hanging fruits for mobile applications. Knowing what their competitors are up to. As a startup, Matchmore has a clear vision of where they want to end up. But how do they get there? For their product, they understand the benefits of competitive intelligence. By scouting social media, their competitors’ websites and products, they try to stay up-to-date about what is moving in their market, which technologies and features to incorporate next and which events and topics are trending. How do you define a competitor? But the question stays: how do you define a competitor? As Matchmore is looking to further improve their product and services, they try to look at everyone with a similar proposal. Providing location-based or proximity features are done by many actors in the industry. However, not a lot of actors are direct competitors since they do not offer multi-device/protocol and scalability as Matchmore does. So even if other actors can provide some similar functionalities, the geomatching technology is what makes Matchmore unique. By segmenting on different levels, they are tracking two groups of direct competitors. This is however one of their biggest frustrations. How can you make sure the competitors you’re following are your real competitors? As everyone describes their features, customer seg­­­­ments and services in their own wording, it is hard to create one comparable list. By scoring their competitors on user-friendliness, the team of Matchmore, creates their own competitive ranking. This helps them to understand who they should watch closely. By using competitive intelligence, they can define their own gaps and truly understand how they can improve the product. This keeps them on track and confirms that they are doing the right thing. Matchmore uses competitive intelligence to strengthen their value proposition.